Robert King Salyers, the first-born child of William Levi and Sarah Eva Howe Salyers, came into the world on March 22, 1907, increasing by one the population of Carrollton, Carroll County, Kentucky. Bobby, as he became known, became the center of the family's attention. While I don't have the scrapbooks Sarah made especially for him, other scrapbooks mention him often. One reference answers a long-standing question. In a box of family photos is the image of a little boy in a baseball uniform. I've never been sure if it was a picture of Bobby or his younger brother David. In a scrapbook is Sarah's transcription of a letter from an aunt, who wrote ". . . tell Bobby I was delighted with his baseball poses." Mystery solved! By the time Bob was 12, he was a handsome young man with three younger siblings following him about. By all accounts, he was a patient and helpful big brother. I wonder if he may also have been helping at his grandfather Charles D. Salyers's tin/stove/hardware store – or helping his father Will Salyers, who sold stoves first at the store and later for Warm Morning Stoves and other companies. I think it's likely because, by the time he was in his mid-20s, Bob was advertising manager of the Moore Stove Company of Illinois. • 1977 – collapsed while walking across the lobby of the University Club in Washington, DC. ; died instantly of an apparent heart attack. As I said in my previous post, I saw Bob only a few times. All I know about him is what I've gathered from his mother's scrapbooks, a few newspaper clippings, and family stories. The timeline certainly doesn't cover the depth and breadth of his life, but it hits some of his major accomplishments. He seemed to be a popular, well-respected man, successful in his public-service career, often called upon as a public speaker, and elected to leadership roles in several organizations. In those ways, he is a lot like his Howe and Salyers ancestors – especially the Howes. I was better acquainted with Bob's wife, Loretta, and his son, Robert K. Salyers, Jr., because they lived in my home town of Louisville for a while. I saw his daughters, Abigail and Martha, less often. The photo on the right shows Loretta and the family's first two children: Abigail (1942-2013) and Bob. I believe it was taken circa 1945. Robert K. Salyers, 70, director of the retired members program for the American Federation of Government Employees, died Tuesday of an apparent heart attack at the University Club, where he kept a room, according to a spokesman for AFGE. Salyers lived on South 5th Road in Arlington. Salyers, who retired in the early 1970s as deputy assistant secretary for labor management relations at the Labor Department, had worked for AFGE since 1974. A Kentucky native, Salyers was director of the National Youth Administration there from 1936 to 1942. During World War II, he was stationed in Iceland with the Navy and after the war was assistant to the director of demobilization for the Navy here. He later served with the Selective Service System and, before joining the Labor Department, was director of the Bureau of Veterans Re-employment Rights. He was a past president of the Kentucky Society of Washington. He leaves his wife, the former Loretta Smith; two daughters, Abigail and Martha, and a son, Robert K. Jr. In the next post, I'll introduce Sarah's twins James Robert and Mary Alice. On March 22, 1907, one year, three months, and eight days after their marriage, Sarah Eva Howe and William Levi Salyers welcomed their first-born into the world. They named him Robert King Salyers, in memory of Will's brother, who died in 1897 at age 16. Three years and 15 days later, their family grew by two! Twins James Richard and Mary Alice were born on April 6, 1910. After another five years, one month, and eight days, on May 14, 1915, another set of twins arrived. Will and Sarah named them David Hillis II (after Will's grandfather) and John (the name of Sarah's grandfather, the Irish immigrant). Imagine the sadness that fell on this family when John died at birth. Will and Sarah reared four children to adulthood. All three sons went off to war, and all three returned. All four of the children became successful professionals in their chosen fields. 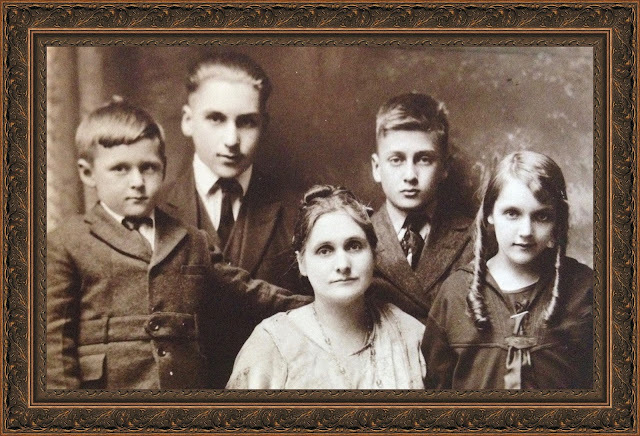 All four married, and three gave Sarah and Will a new generation of Howe-Salyers descendants. The next few posts will share profiles and stories about the four children. I'll have more to say about the three youngest than about the first-born. Robert lived much of his adult life in and around Washington, D.C., while the other three lived in my home state of Kentucky. I saw "Uncle Bob" only a few times, while I knew the others well, especially Mary Alice and David. In fact, in 1966, David became my father-in-law! I have found scrapbooks created by Sarah for Mary Alice and for David. So far, no luck finding books specific to Robert or James. Sarah probably gave them their books at some point, and they have been lost to us. Thank goodness for Mary Alice! She saved all of the scrapbooks made for her and her little brother David. We'll go through those books together in this blog and, in the process, learn what growing up was like in the first 30 years of the 20th century. In the previous three posts, we took a virtual visit to Ireland through a travel diary written in 1876 by Robert J. and John I. Howe, sons born in America to Irish immigrants John and Sarah Brown Howe. Today, we go to Ireland again, some 131 years later, through photos and information provided by Howe descendant Richard Allen Hays. Al is a first cousin to my husband David H. Salyers III, and both of them are great-great grandsons of John and Sarah. Al has done much research on his Howe ancestry and is my go-to source for details about the family. 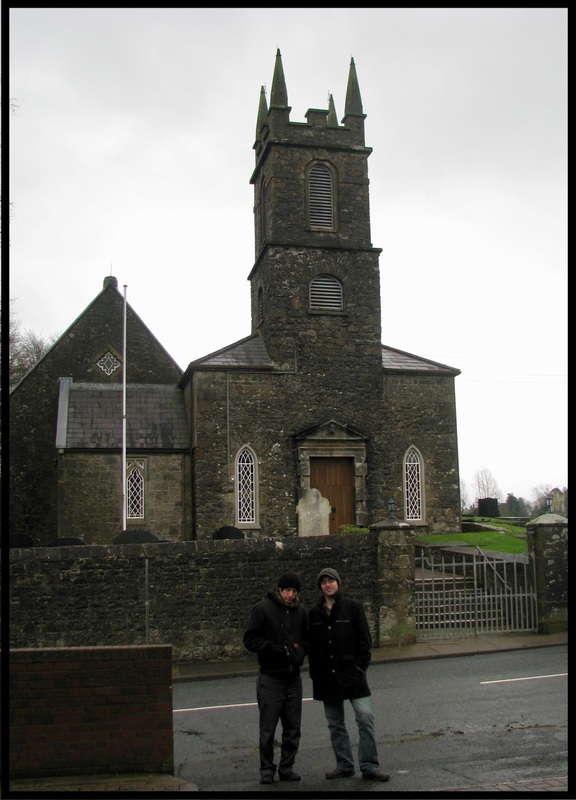 In 2007, Al, his wife Pam, and his sons Mark and Michael visited County Fermanagh, Fivemiletown (in County Tyrone), and other places with ancestral ties. He shared the following notes and images with me. My own comments are in brackets. because other Protestants were required to make births and marriages "official" at the local Church of Ireland (England) even if they weren't members. This is one thing that our largely Presbyterian Scots/Irish ancestors resented and which acted as a stimulus to migration to America. As far as I know, the church is the same building [in which John was christened in 1823]. According to my grandmother [Sarah Eva Howe Salyers, our scrapbooker], John Howe always proudly declared himself to be an Orangeman, i.e. a Northern Ireland Protestant. Had he been alive and living in Ireland, he would have probably joined several hundred thousand other Protestants in signing a pledge in 1912 to never accept Home Rule for Ireland, let alone independence. Their slogan was "Home rule = Rome rule." The tragedy of Northern Ireland is that these Protestants feared becoming a minority in an independent Ireland that would encompass the whole island, so, with British support, they created Northern Ireland, where they would be the majority (and would mistreat the Catholic minority there). So, I am not sure how he would have felt about the largely Catholic holiday of St. Patrick's Day. On the other hand, in contemporary Northern Ireland they have tried, with some success, to make St. Patrick's Day a shared holiday among Protestants and Catholics. 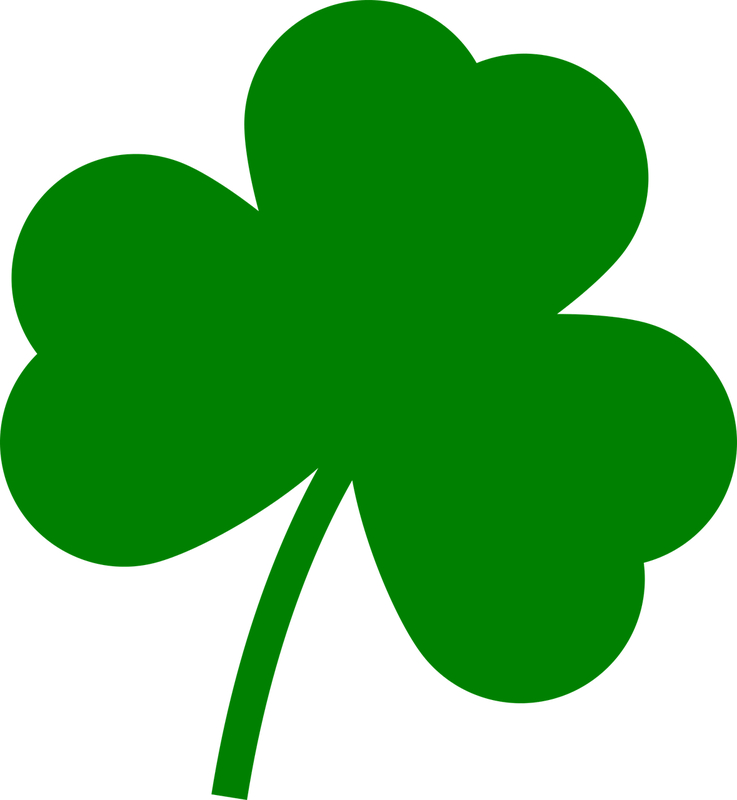 After all, the Irish never made that big a deal out of the holiday until Irish Americans started celebrating it. Church, which is located on the outskirts of Fivemiletown. The town is in County Tyrone, but our relatives lived just across the border in County Fermanagh. 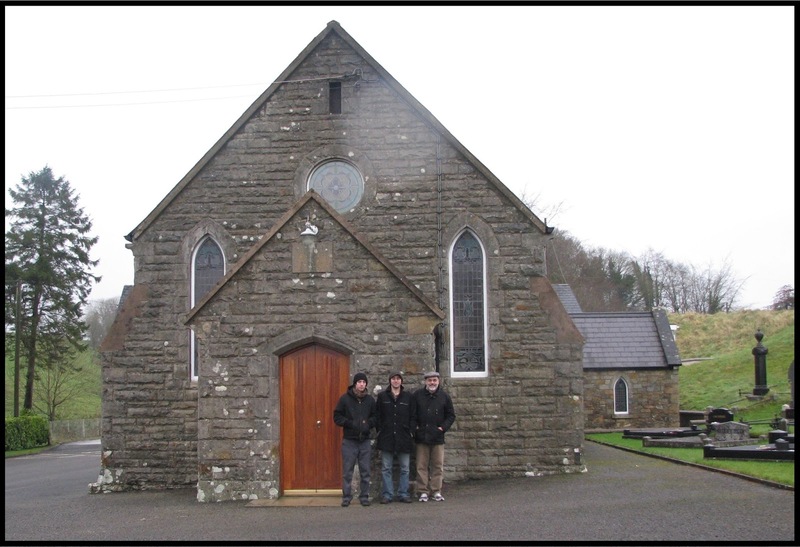 Mark, Michael, and I posed for this picture in front of the church. It's not the same building that was there when our ancestors were married, but it is the same congregation. As for the Scots-Irish1 part, it has yet to be determined whether the Howes were originally from England or Scotland. There were a lot of prominent Howes in England at the end of the 18th century; you may recall the two brothers2 who were generals against us in the War for Independence. (Fortunately, they made some mistakes that helped us win!) However, there is no established line between our Howes and theirs. Our line goes back to Robert, John's father, and the records end there. When the "plantation" of Protestant settlers into northern Ireland began in the early 1600s, both English and Scottish farmers came over, and they were given land by the English nobles who claimed it after the O'Neills (the native rulers) fled following defeat by Queen Elizabeth's army. The Scots are best known because so many Americans claim to be "Scots/Irish," although I doubt that a lot of people know what that really means. The idea was to put loyal Protestants in control of the best land and push the recalcitrant Catholics onto the poor land — hence the latter's dependence on potatoes, which would grow on such land. Robert Howe is listed as "farmer" in the records, and from the 1876 diary it sounds like their abode was pretty humble. 1The term Scots-Irish appears to be used only in North America. Read what Scotland-born historian and author Raymond Campbell Paterson has to say on the matter at http://www.ulsterancestry.com/ulster-scots.html. The three-part series from the Howe brothers' Ireland travel diary are in posts dated March 12, March 19, and March 26 (all 2017). Al's information sent me back to those posts with a new understanding of the Howes and the social and political climate of their time.